Check out the FIVE new webinars from Dr. Sally Foote. 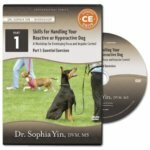 Vet Med Professionals will want to see "Dr. Foote's Best Behavior Cocktails"! Click here to be taken to the new webinars. Shopping for a DVD but don’t want to wait for it/them to arrive? Don’t do DVD’s anymore? Check out our Vimeo video stream. Click here to rent, or buy for download. Buy the Perfect Puppy in 7 Days, Creating the Perfect Puppy DVD, the Perfect Puppy Bundle, and/or Kitty Kindergarten on sale! Click the links and save! Sale runs March 26th – April 9th. Vet Med grads, are you sweating the NAVLEs? Now through April 15th, buy the world famous Small Animal Veterinary Nerdbook® and save 25%*. Be a Superhero in Clinics or at your Boards! With The Small Animal Veterinary Nerdbook® you’ll go from mild-mannered regular student to brilliant master student in under 500 pages. You’ll find information fast, understand concepts easily, and finally see the Big Picture. Use it in clinics or for Board Exam review. The new softcover edition easily slips in your lab coat pocket or utility belt, ready for action at a moment’s notice. *not available with other discounts. Subject to change without notice. From Missile-Guided Pigeons to Spy Dogs. Copyright © 2019 CattleDog Publishing: Low Stress Handling® University. All Rights Reserved.